Printable pdf of this blog post here. 1. Most people on Medicaid are already working. Those who are not working, are most likely to be found taking care of young children, elderly relatives, to be living in high unemployment areas, or to be in poor health themselves. The vast majority of individuals in Medicaid are in households with at least one working person (Kaiser Family Foundation, 2016). In December 2017, a team of University of Michigan researchers did extensive research on individuals in the Michigan Medicaid expansion, called the Healthy Michigan Plan, population. Over one fourth are out of work, many of them because they are in fair or poor health. Three-quarters of those who were out of work reported having a chronic health condition. NOTE: This study was the first peer-reviewed study from the formal evaluation of Michigan's expansion, called the Healthy Michigan Plan. The evaluation, funded by a contract with the Michigan Department of Health and Human Services, was required under Michigan's federal waiver. As Renuka Tipirneni, lead author of the study notes, "'Is it worth the cost to screen and track enrollees when only a small minority isn't working who are potentially able to work?" 2. The Medicaid expansion has helped improve individuals' health. Health improvements mean it is more likely that they will be able to work--now or in the future. According to the UM IHPI study, "In all, nearly half of the newly covered Michiganders said their physical health improved in the first year of coverage, and nearly 40 percent said their mental or dental health got better. Those who said their health improved also had the most chance of experiencing an effect on their work life. As a group, they were four times more likely to say that getting Medicaid coverage helped them do a better job at work. And those who felt their health had improved, but were out of work, were three times as likely to say that their coverage helped them look for a job." 3. Work requirements can worsen (or externalize) other problems. For instance, a person with epilepsy who loses access to seizure medications could have a seizure while driving and have a car accident. The cost, then, is to the individual (who is injured by the car accident and seizure), to the costs to the insurance system, and potentially to other individuals involved in the car accident. 4. Work requirements cost the system more. Work requirements drive people to more expensive care. Rather than a person getting preventive care, and a prescription, from a primary care doctor for an easily treated problem like high blood pressure, they are more likely to end up in the emergency room, where they know they will not be turned away. Rather than getting a free flu vaccine, they are more likely to get the flu--ending up infecting others, requiring time off work, and perhaps risking a hospitalization. 5. Work requirements place a huge administrative burden on Department of Health and Human Services (DHHS) staff. DHHS staff already struggle under enormous caseloads. The administrative burden of this additional work is significant. The true number of people who could work but aren't is small. Yet requiring people to show that they are working, or cannot work, requires a lot of time on the part of DHHS staff. 6. Work requirements place a huge administrative burden on individuals with Medicaid. In addition, they are likely to affect many others. For instance, if one person in a family does not return proof they are working, others in the family may be wrongfully cut off. This policy is another bureaucratic obstacle intended to keep poor people from getting healthcare. 7. We are in the midst of an opioid epidemic and a surge in suicides. Mental health and substance use disorder services are essential; suicide is preventable. Work requirements make it difficult for individuals getting mental health or substance use treatment to continue to get treatment. In 2015, the State of Michigan's Prescription Drug and Opioid Abuse Task Force report recommended " exploring ways for the State to increase access to care, including wraparound services and MAT [Medication-Assisted Therapy], as indicated by national and state guidelines for treatment. (p. 20)" Work requirements would surely reduce access to care. 8. Work requirements put physicians and nurses in an untenable position. Physicians take the Hippocratic oath, to do no harm, but if people are cut off of Medicaid and physicians are unable to get paid for patient visits, their organizations will find it financially untenable to take care of these patients. That is one reason that the American College of Physicians, the American Academy of Family Physicians, the American Congress of Obstetricians and Gynecologists, the American Osteopathic Association, the American Psychiatric Association and the American Academy of Pediatrics have taken a position against Medicaid work requirements. Read their statement here. 9. Work requirements threaten the health of people with disabilities. As the IHPI study indicates, many individuals who have Medicaid and are not working are doing so because they are in poor or fair health. In the experience of staff at the Washtenaw Health Plan, in many cases the access to health care allows people to either a) get better, and start working or b) get the necessary evidence from competent physicians to show that they are disabled. Without Medicaid, many individuals would not be able to collect the medical evidence to prove that they are disabled. In 2016, the Kaiser Family Foundation found that 36% of people on Medicaid who are not working are disabled. 10. The Washtenaw Health Plan and the Washtenaw County Health Department believe that healthcare is a human right. We oppose efforts to reduce access to coverage, and believe in healthcare for all. The Washtenaw County Board of Commissioners agrees with us. Read their resolution here. Sometimes you may feel blue. Sometimes the mood lifts and sometimes it just lingers on and on. You might try talking with a friend, going for a walk. But it seems that no matter what you do, the blues continue. At these times, you might feel that no one understands or worse, that no one cares. You may feel that you are all alone. If you are feeling hopeless or you are with someone who is feeling suicidal, call 911, go to the Emergency Room or go to a Psychiatric Emergency Room immediately. Additional resources that are available 24/7: nationally, call 1-800-273-TALK (8255), text Hello to 741741, or in Washtenaw County, call 734-544-3050. Under the current health care system, mental health is part of the essential health benefits that all health insurance must cover. If you currently have insurance, you have a mental health benefit of at least 20 visits per year. With this benefit, you can see a psychiatrist, psychologist, social worker or therapist as long as they are part of your health care network. As of October 1, 2017, Michigan Medicaid lifted the 20 visit cap on Mental Health visits. You are now able to see any provider that accepts Medicaid or a Medicaid Health Plan for as long as needed. An official notice is here. Depression and anxiety are the most common mental health conditions. Some people have chronic mental health conditions, but many people may have temporary conditions that are treatable and preventable. Depression is a sad or blue mood that lasts for more than two weeks and affects a person's ability to work, carry out usual daily activities and have meaningful personal relationships. Symptoms of depression that need treatment include at least two of the following; lack of energy and tiredness, unusually sad mood, loss of enjoyment and interest in activities, sleeping difficulties, concentration and decision making problems, feeling worthless or guilty, thinking about death or dying, loss of interest in food or eating too much. Depression is treatable. Suicide is on the rise. At any time if anyone is feeling hopeless or talking of suicide, call 911. Washtenaw County officers have special training for mental health emergencies. Tell the 911 operator that your emergency is mental health related and they will send trained officers. Here are some good tips, if someone you are close to is feeling suicidal. Make an appointment with your Primary Care Physician (PCP) or regular doctor. Your regular doctor can prescribe anti-depressants, talk about lifestyle choices and refer you for further treatment. Many PCPs now use a depression or mental screening questionnaire that helps determine next steps. Search for psychiatrists, social workers, psychologists or counselors that accept your insurance. You may find that information on the insurer's website or by calling them and asking for nearby therapists. For Medicaid health plans, contact your Medicaid health plan. The number is on the back of your card or search your provider's website. Find a support group. Some support groups are free. If there is a cost, you may want to check with your insurer to make sure you are seeing someone in your network. Find a counselor or community agency. If you don't have insurance but need attention, there are resources for counseling and help. Community Mental Health has a crisis team that can be reached by calling 734-544-3050. Everyone needs help at some point in their life. Talk to your doctor and get help. 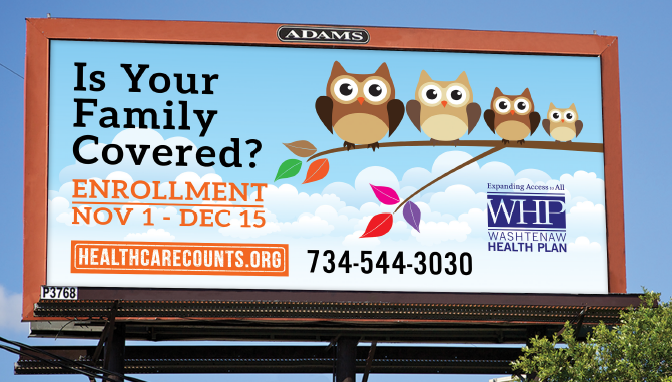 If you need help with health insurance, contact the Washtenaw Health Plan. Call 734-544-3030 or walk-in to our offices at 555 Towner, Ypsilanti, Monday through Friday from 9am-4pm. Washtenaw Community Mental Health Call Access at 734-544-3050 or 1-800-440-7548 for crisis service, support or information. Available 24 hours/day, 7 days/week.